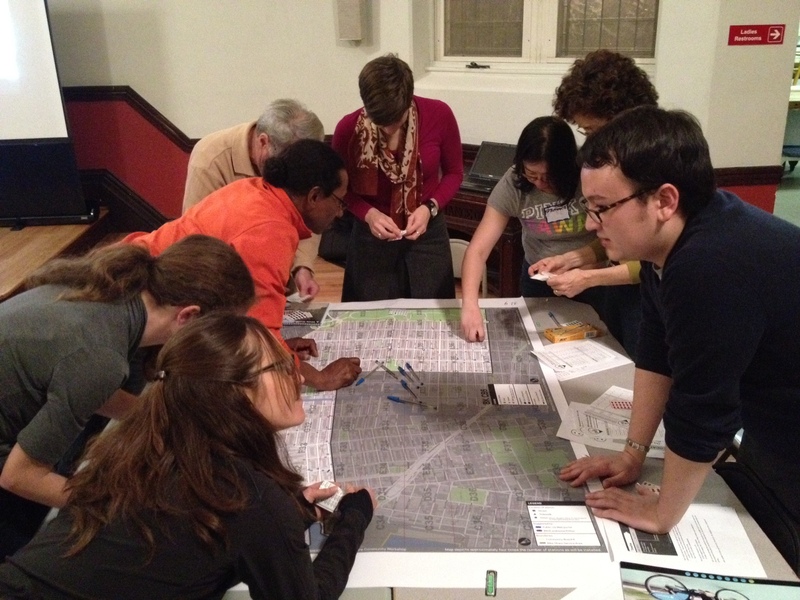 Here’s a snapshot from last Thursday’s CB6 Bike Share Planning Workshop in Park Slope. It was an active and spirited process, with overwhelmingly positive group of participants offering their two cents. I can’t speak for every table, but at mine every community member had overwhelmingly positive ideas for where stations should be placed, with the majority favoring on-street locations over sidewalks. Wedensday, March 21st:Community Board 3’s workshop will be held at Restoration Plaza, 1368 Fulton Street in the Multi-Purpose Room. Sessions begin at 6:00 and 7:00 pm. Thursday, March 22nd:Community Board 1’s workshop will be held at the Swinging 60s Senior Center, 211 Ainslie Street, Brooklyn, New York 11211. Sessions begin at 6:00 and 7:00 pm. If I’m not mistaken, this week will wrap up the planning process for Brooklyn, so if you live, work, or play in these districts make sure you don’t miss your chance to have your say. As an added bonus a sample bike will be on display, giving you an opportunity to kick the tires.